On April 10, a navigation period on the Neva river for cargo vessels has officially started. That inaugurated also the start of the city’s biggest show, the drawing bridges, which is necessary for letting vessels get through. Though, no any bridge has not been raised today as there have been no ships passing along the river. Since the start of the 2017 season, some changes to the drawing schedule have been made. The Dvortsovy (Palace) and Troitsky bridges start raising 15 minutes later than they had been doing for last years. The both bridges are the most popular among spectators. 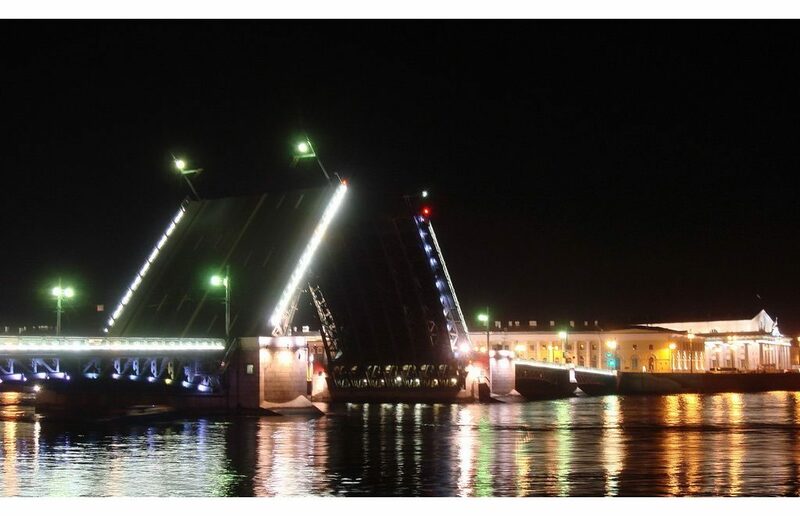 The Palace bridge opens at 01.10 while Troitsky at 01.20. The timetable of all drawbridges we posted here. There is a special mobile app for iOs and Android available with push-ups to signal the start of drawing of a bridge to help people navigate their ways through the city. Please, note, that in April (like in November) not each bridge is raised every day. The schedule depends on the needs of cargo vessels. The most popular bridge among tourists, the Dvortsovy (the Palace) bridge, is raised almost everyday in the high season (with some scheduled exceptions due to festival days), but that’s not the case for April.